Facebook released a new suite of tools meant to give users more control over what they see in their News Feed. Users can categorize the friends and pages on their feed to four different preferences: Prioritize who to see first, unfollow people to hide their posts, reconnect with people you unfollowed, and discover new pages. 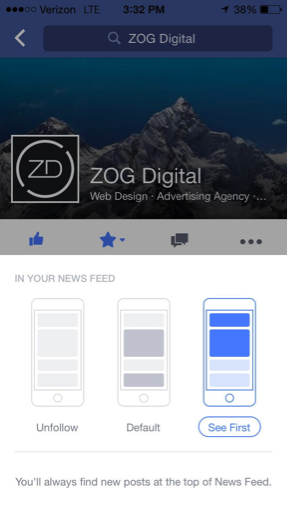 Users now have the ability to choose what posts they see first when they open Facebook on their iOS device and, soon, their browsers. For brands, this is a new and powerful feature to take advantage of. Following their previous News Feed update, Facebook has now given users a way to work around their complicated algorithm and lets users say, “I want really do want to see more of this.” The update means brands will need to adjust their social media strategy to encourage users to favorite their page by reshaping social content. Brands will need to push users to take action with engaging content and CTAs within social postings. Notably, to remind users that they are seeing more of this content, a blue star is placed above the prioritized stories. The new option allows users to select 30 accounts whose newest updates will always appear first in the News Feed. The missed posts will be grouped together, with two being visible with the option to see the other Facebook posts shared by the account. The newfound ability for Facebook’s 1.44 billion users to prioritize not just posts, but entire accounts, has brands and marketers excited at a new way to build their social audience. And why not? This is a chance for them to work around the “popularity contest” news feed algorithm, increase their ROI and nab a boost in reach and engagement. Asking for a Likes and Shares on Facebook is fairly acceptable, so it follows that being “starred” will be too. People make new friends and find new Pages to Like, but, chances are, they will not spend any more time on their News Feed. There are only so many hours in a day, and only so much of it will be spent on Facebook. With the Facebook user base growing faster than the attention spans of its users, this new feature for marketers comes into play right as the value of a Like declines. Competition for reach and engagement on the social platform is at an all-time high. With less time spent on the News Feed, Pages were competing for Facebook comments. Now, social media managers have a new way to build engagement and likes. Don’t get left in the dust as other marketers start strategizing new campaigns for the coveted blue star. There’s also a new algorithm in the game with the “discover new pages” feature. Based on the types of pages a user has liked or people like the user have liked, they can discover new brands to follow based on similar features categorized by this new algorithm update. This new feature is truly a boon to smaller businesses, news outlets, artists or brands that can get lost in the Facebook noise. Previously, the only avenue to ensure posts were seen and ensure accounts received likes was invest in targeted Page Like ads, which become less valuable with time.